The Corner Drug Store is a 300 large piece jigsaw is designed by Kay Lamb Shannon. 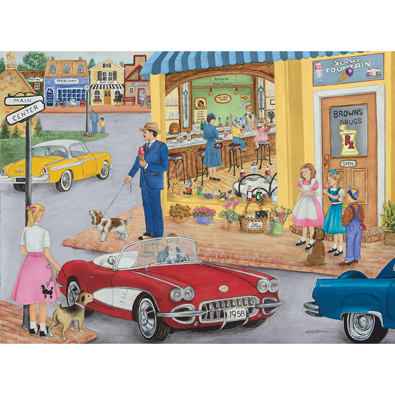 The puzzle depicts a busy street corner in colourful town. This 300 large piece jigsaw is designed by Larry Jones and measures 45cmx 61cm. Two birds sit together on a now covered berry tree on a cold winter's night, highlighted only by the warm glow of a nearby cabin. This 300 large piece jigsaw is designed by Tom Woods and measures 18" x 24". Available in two sizes. This 300 large piece jigsaw is designed by Liz Goodrick-Dillon and measures 45cm x 61cm. Three children stumble down the stairs Christmas night to see the man himself in action.